Practice Manufacturing Engineering questions and answers for interviews, campus placements, online tests, aptitude tests, quizzes and competitive exams. This set of Manufacturing Engineering Multiple Choice Questions & Answers (MCQs) focuses on “Introduction To Ceramics”. 1. Which of the following is not a characteristic of ceramics? Explanation: Ceramics are non-metallic, inorganic and amorphous solids. 2. Which of the following is a correct chemical property of quartz? Explanation: Quartz comes under acidic refractory. 3. Which one of the following is not an acidic refractory? Explanation: Dolomite is a basic refractory. 4. Which one of the following is not a basic refractory? Explanation: Sand is an acidic refractory. 5. Which one of the following is a chemically neutral refractory? Explanation: Silicon carbide is a neutral refractory, whereas sand, quartz and silica brick are acidic. Explanation: M10 grade of RCC have cement to aggregate to sand ratio equal to 1:3:6. Explanation: Tape casting is a very old process and is used in the formation of flexible tapes. 8. Which of the following can act as a modifier in glass forming process? Explanation: Magnesium oxide is best to use as a modifier in glass forming process. 9. The word ceramic stands for which of the following meaning? Explanation: The dictionary meaning of ceramics is burnt materials. 10. Which of the ceramics can be used as pigment in paints? Explanation: Titanium oxide is generally used as pigment in paints. It has a very high density. 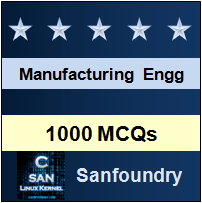 Sanfoundry Global Education & Learning Series – Manufacturing Engineering. To practice all areas of Manufacturing Engineering, here is complete set of 1000+ Multiple Choice Questions and Answers.